The Supreme Court yesterday, ruled that land powers were vested in the government and not in the Provincial Councils. 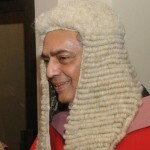 The bench comprised de facto Chief Justice Mohan Peiris and Justices K. Sripavan and Eva Wanasundera. The Judges ruled that under the constitution land was vested in the people or the central government to be handed over to the provincial councils according to law and on their request.